Glass Boat Ride is mainly undertaken to explore the marvelous dolphins and other living marine creatures in Andaman. A quality glass speed boat ride is always invigorating and adding some spice to an Andaman trip. The ride is comfortable and luxurious. Andaman water sports complex is the ideal place to ride in glass boats. Port Blair, Havelock, North Bay Island and Neil Island are very much sought-after locales for this popular holiday activity. 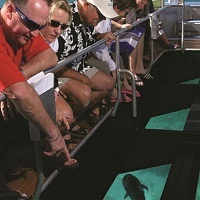 Elderly people and those suffering from sea sickness should avoid glass boat rides.